This vibrant pineapple beet smoothie is packed with nutrient dense, vitamin rich superfoods and has a delicious tropical flavor! What better way to prep for cold and flu season than with a vitamin C boosted, tropical punch flavored, super smoothie? This supercharged smoothie follows the Fresh 5 smoothie template, a balanced and nutritionally rich meal replacement smoothie formula. Wash and dry the fresh produce. Remove the ends from the carrots and beet. Save the beet greens to make a super nutrient rich green smoothie! Peel the carrots, beet, and orange. Add the ingredients to the blender starting with coconut water. Next add the soft ingredients, orange, banana, and pineapple. Then add the harder veggies, carrots and the beet. Finally, add any frozen fruit or ice on top. This blender layering technique pushes the ingredients down into the blades and helps to create a perfectly smooth texture! Fresh Tip: If you don’t have a high speed blender like a Vitamix (I saved over $150 on my Vitamix by buying it refurbished) then you may have trouble liquefying the carrots. Try blending just the carrots with the coconut water first before adding other ingredients! Blend until smooth and you’ve reached your desired consistency. Once blended add any protein or superfood boosts you’d like. I used camu camu powder, baobab powder, and flaxseeds! Fresh Tip: Be sure to use at least one frozen fruit so that your smoothie is cold and smooth! I like to halve, peel, and then freeze any bananas that are going brown. It stops me from having to throw them out and frozen bananas make perfect creamy smoothies! Most people are used to the idea of veggies in their green smoothies, but incorporating all colors of fruit and vegetables in our diet is important. This upbeat red smoothie is packed with vitamins and minerals thanks to the nutrient dense, energy boosting beets. But this smoothie’s main draw (besides the delicious flavor of course) is its immune boosting properties! The pineapple and orange in here alone offers over 160% of the recommended daily value of vitamin C (a crucially important vitamin for your immune system). But it’s flu season and sometimes your immune system just needs all the help it can get. That’s why camu camu powder is my superfood booster of choice for this smoothie. Just 1 tsp. of camu camu powder contains 760% of your daily value of vitamin C! This little Peruvian berry truly is remarkable. Another superfood I like to use in this smoothie is baobab. Baobab is the fruit of Africa’s “tree of life” and is also a rich source of vitamin C.
But what baobab is really known for is its high content of both soluble and insoluble fibers. This makes baobab an excellent prebiotic to promote a healthy gut. Want more delicious and naturally healing smoothies like this one? Check out this anti-inflammatory smoothie with turmeric – a tropical green smoothie full of powerful anti-inflammatory ingredients! 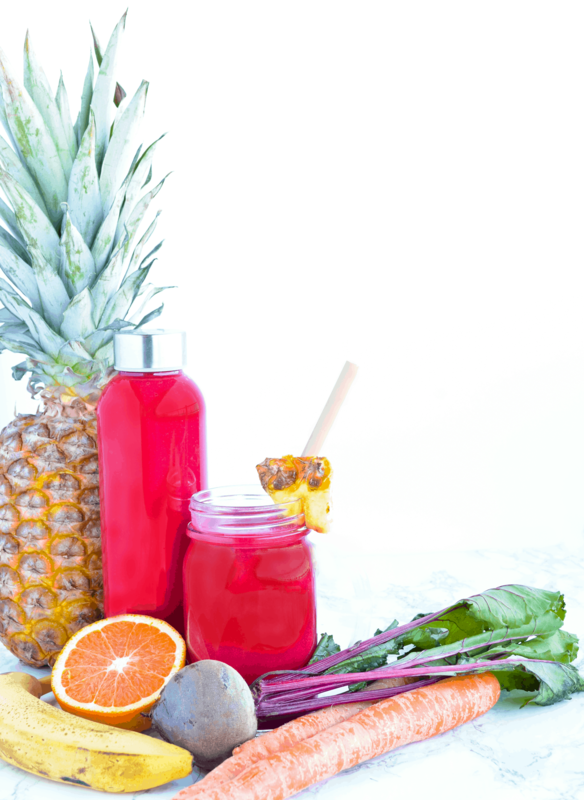 This vibrant red smoothie has a delicious tropical punch taste and is a vitamin C powerhouse. The perfect smoothie to get rid of those winter blues and supercharge your immune system for cold and flu season! Make sure you use at least one frozen fruit (either banana or pineapple chunks) to make your smoothie cold and smooth! If you don’t have a high powered blender like a Vitamix, you may need to blend the carrots with just coconut water before adding other ingredients.